Could this new colour laser printer tempt you away from your inkjet? It's big and bulky, but is the Brother HL-4150CDN worth the money? It's surprising how cheap colour laser printers have become. The new Brother range starts at only £260, though this particular model is a little more expensive at £445. The Brother HL-4150CDN can be connected through USB or Ethernet, and can serve one to 10 users. It has built-in LCD screen, a 250-sheet tray with an option for an extra 500 sheets and a 50-sheet multipurpose media tray for envelopes, thin card and more. For sensitive documents, there's PIN-protected printing. Windows 7, Vista, XP and 2000 are supported out of the box, as is Mac OS X 10.4.11 or later, with Linux drivers available to download from http://solutions.brother.com. Duplex printing is catered for, and you can print PDF, TIFF and JPEG files from a compatible USB drive. 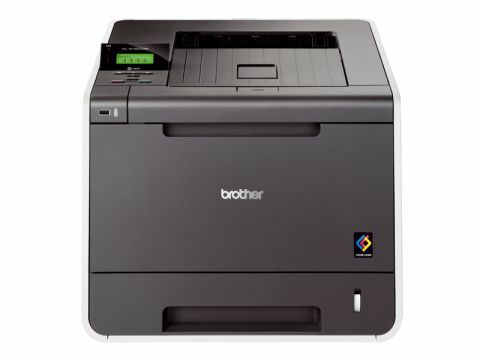 The Brother HL-4150CDN promises up to 24 pages per minute, with the first page out in under 16 seconds. We found these figures a little optimistic. Our 20-page test document printed in around one minute and 10 seconds, with the first page ready in 22.3 seconds. With Duplex switched on, it printed in one minute and 35 seconds, which is slower than the claimed seven pages per minute, but far from sluggish. Our photo test card printed in 23.3 seconds. Print quality was pretty good for a laser printer of this price. Text printing was clear and vivid, with even the smallest point sizes perfectly readable. It could've been a little darker, but without comparing it side by side to a print-out from a more expensive laser printer, you're unlikely to find fault with the Brother HL-4150CDM. Colour documents also printed very well, with clear text, good contrast and very little banding. Colours were rich and accurate, and shading well realised. It was less capable when reproducing photographs. The images were a little grainy, the grayscale ramp very banded and colour reproduction was definitely over-dark. To be fair, photo printing is hardly the main reason for buying a colour laser printer, but it's worth bearing in mind if you print a lot of documents containing photos. A secure printing option keeps sensitive documents away from prying eyes. After entering a four-digit number on your computer, the print job is passed to the printer, but not actually printed until you enter the same code on the HL-4150CDN's screen. Very useful if your printer is networked and shared. As well as being inexpensive to buy, the Brother HL-4150CDN is reasonably cost-effective to run. Taking the higher-yield toner cartridges at the prices offered on Brother's website, the cost per page of a black and white print-out is 1.73 pence, and colour pages at 12.29 pence (both figures offered without the cost of the paper itself). Perhaps the colour cost is a little high, but it's bound to fall as the printer series achieves market penetration and net-discounted cartridges arrive.